The launch of a new Alfa Romeo is big news. For the Stelvio, available in the UK from September 2017, the news has extra importance. It’s Alfa’s first SUV. And a car that takes its name from one of the most well known driving roads in Europe, the Stelvio Pass. Few car brands convey the senses of passion, style and driver engagement as Alfa Romeo. One of Italy’s oldest, it has a rich motorsport heritage and history of exciting road cars. This has kept the brand going through difficult times, with die-hard enthusiasts continuing to see the appeal of owning one when reliability, quality and the dealer network have failed to hit the mark. The Stelvio arrives only a short time after the Giulia saloon and shares its basic structure and technology. This is good news as the Giulia is a competent and interesting alternative to cars such as the BMW 3 Series and Jaguar XE. The challenge for Alfa is creating an SUV that does what new customers would expect of it, as well as remaining true to Alfa’s traditional values. The Stelvio was first unveiled in high-performance Quadrifoglio specification. But when it arrives in the UK in September, customers will be able to choose from a rear-wheel drive 2.2-litre 180PS diesel alongside Q4 all-wheel drive models including a more powerful 210PS version of the diesel and a 2.0-litre turbo petrol with 200PS or 280PS. We tested both the 2.2-litre 210PS diesel and the 2.0-litre 280PS petrol. The most powerful diesel variant, equipped with all-wheel drive and an eight-speed automatic transmission, has claimed fuel consumption of 58.9mpg, an improvement over what’s currently offered by the Jaguar F-Pace, BMW X3 and Mercedes-Benz GLC. On paper at least. We expect the 180PS diesel to match or better these figures when data is released. 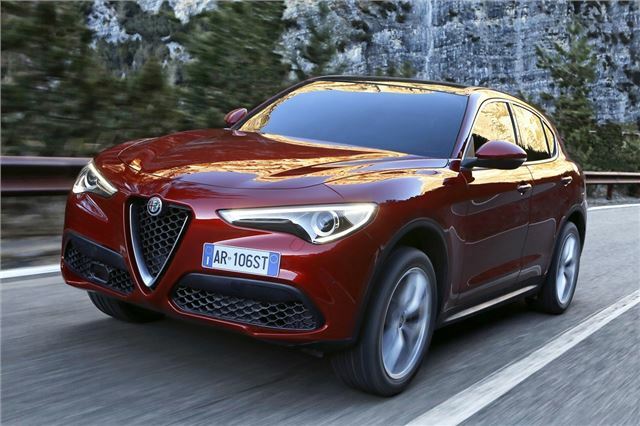 Alfa Romeo has stressed that making the Stelvio was about creating an SUV that still drives like an Alfa Romeo. The steering is very direct, while the all-wheel drive system has a rear bias, with up to 50 per cent of torque being sent to the front wheels when required. It feels exceptionally responsive on the twisty alpine roads of our test route, easily dispatching repeated hairpin bends with barely half a lock of steering and an impressive lack of body roll. The eight-speed automatic transmission plus the 450Nm of torque that's available from 1500rpm - ensure it almost catapults along the next straight stretch. The engine is perhaps a little noisier than four-cylinder diesels in the X3 and Q5, plus the gearbox does like to ensure it holds a low gear for safety when heading downhill. To many, Alfa Romeo is all about ‘benzina macchine’, or petrol cars. The 280PS petrol engine doesn’t disappoint for performance with 0-62mph in 5.7 seconds. But it doesn’t sound particularly special unless at high revs – and with the low-down pulling power of the turbo, there isn’t really much need to go chasing revs. At higher speeds, the Stelvio remains exceptionally composed, resisting the urge to lean away from bends when cornering. The ride is on the firm side and we wonder how this will feel on UK roads compared with the generally smoother ones on our test route. Like all Alfa models, the Stelvio comes with the ‘DNA’ system, which modifies the car’s responses and behaviour. ‘D’ for dynamic, creates a sharper feel with more responsive steering and throttle, as well as less intervention from the electronic systems. The 'N' natural setting feels lively enough while ‘A’ now stands for advanced efficiency (it used to mean all weather) and maximises energy savings. The Stelvio has many of the Giulia’s design cues, despite its extra height. The short front overhang and long rear overhang are in keeping with saloon or coupe proportions while the wheelbase is an identical length. It means the interior is spacious enough for four adults in comfort, or five that know each other very well. The minimum boot capacity of 525 litres is pretty good, while the Stelvio’s maximum towing capacity of 2300kg for the Q4 models we tested is also competitive. All versions of the Stelvio will come with an eight-speed automatic transmission as standard. The entry-level model will have a 6.5-inch screen, DNA system, a central TFT info screen between the speedometer and rev counter (no fancy Audi-style digital instrument screen here) and a start button on the steering wheel. Alloys are 17-inch on this model, with fabric seats, although safety sytems include lane departure warning, forward collision warning and autonomous emergency braking with pedestrian detection. Higher versions come with xenon headlights, larger wheels, part-leather or leather seats and extra features. There are two main option packs – luxury and sport, both offering full leather but with different front seat designs, while the former offers wood dashboard and door inserts with the latter providing aluminium. The Stelvio also comes with business specific grades to appeal to company car choosers.